Celebrate the Stars and Stripes with Party Cheap! We have plenty of 4th of July decorations to make your 4th of July cookout, picnic, or party a success. 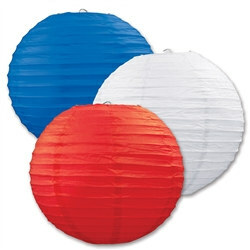 Transform your backyard into the ultimate party venue with our red, white, and blue decorations. We have a number of patriotic outdoor decorations that are great for a cookout or picnic. Start by setting up tables so your guests can relax and munch on traditional 4th of July cuisine: burgers and hot dogs! Don't leave those tables bare: protect them with our Red and White Tablecover, then decorate with any number of patriotic centerpieces. Of course, no patriotic party would be complete without some american flag decorations! Hang up a Gigantic American Flag, or hang our patriotic bunting from your porch or fence. Decorating doesn't have to be a chore: our 4th of July cutouts and decorations are a quick and easy solution to a plain party! If you are determined to have the best table settings this fourth of July we are here to help! Create an explosion of red, white, and blue in your home with our fantastic selection of 4th of July decorations. From shiny metallic garland to American tissue bells, we have lots of different types of patriotic decorations to help you create the perfect 4th of July style. Now lets turn your plain tables into fabulous tables! If you are focusing this year on having an elaborate food table set up you will want to get a solid colored, red white or blue table cover to start. Depending on how much food you are serving will determine if you want a centerpiece or not. We have several Patriotic centerpieces that will look great around your crock pots and dishes. Drape some Red, white and blue garland behind your table and our jointed red, white and blue bunting cutout from the front of the table. Add some American Flag food picks to your finger foods and use our assorted metal patriotic buckets to hold the silverware. Then make sure to use our red, white or blue tableware or mix and match all three! If your main focus this year is a smaller gathering and you are looking to focus on individual table settings we've got you covered too! We have a red, white and blue table cover to cover your table. Then to create a patriotic coordinated table set mix and match our red, white and blue tableware. For example blue dinner plates, red dessert plates, and white napkins and get red cups and blue silverware to further accent your table settings. With our inexpensive but beautifully designed centerpieces, like the Star Gleam 'N Shape centerpiece or the Red, White, and Blue Firework chandelier you can add some sparkle to your table. Serve your food and munchies from our large bowls in red, white or blue and our assorted patriotic buckets. If you want a more country centerpiece get some mason jars, fill them with sun flowers and stick in one of our Patriotic pinwheels. Our 4th of July Hanging Decorations can be used indoors or outdoors to decorate your home for the 4th of July. Our red, white, and blue patriotic decorations can be used just about anytime of year, but they look especially good around Independence Day. 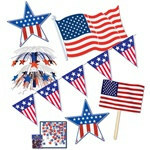 We have dozens of patriotic colored banners, garland, and cutouts to decorate your home or office for the 4th of July. 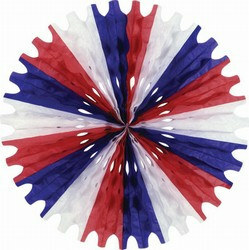 Make sure you check out some of our more unique items, like the patriotic wind spinners and American flag door cover. We've got all the memorable 4th of July party decorations you will need to create a patriotic atmosphere at your next Independence Day party.